Blackjack Ketchum and his gang of outlaws has just robbed the bank in Bellevue—left the clerk face down—and come riding into Ketchum determined to do the same there. "They ride into town whooping and shooting their guns," said Kelly Heuett, who plays the sheriff in the Blackjack Ketchum Shootout Gang performances for Wagon Days. The sheriff confronts the bandits and Blackjack promises to behave, but the hoodlums end up trying to rob the bank anyway. "They actually come out with the money and one of our members in the crowd has a wanted poster and he gets shot in the back and that's when I find out there's a robbery taking place and I come out and save the day," Heuett said. This year's performance marks the 50th year of shootouts for Wagon Days, a tradition that started as a prank by local shooting enthusiasts Bob Black and Gale Dyer. Unannounced to anyone, Black and Dyer loaded their guns with blanks, pretended to have an argument and ended up on the street shooting at each other. 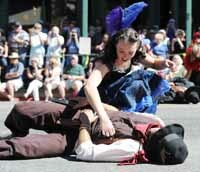 The prank drew a crowd, and shootouts became a feature of Wagon Days. Longtime resident Ivan Swaner was in the original cast and after 50 years he's still a member. The gang will do three performances again this year. The first is set for Friday, Sept 2, at 7 p.m. on Main Street in front of the Casino Club. The action moves to Main Street in front of the Pioneer Saloon for a shootout starting at 12:15 p.m. on Saturday, Sept. 3. It's back to the Casino Club for a 7 p.m. performance later that day. "In 50 years of doing this the scripts have evolved, but its basically just good guys and bad guys shooting at each other," Heuett said. "It's basically the same story line, but every performance is different because of the adlibbing." For Heuett and the 24-member shootout gang cast, it's a chance to play cowboys, something most folks did as children. "I guess it brings out the kid in us," Heuett said. "We all like to play cowboys and Indians and everybody loves a shootout. I think most of us kids did. "It's just been so much fun to do for the people and to see their reactions. It's been absolutely fun. I've been doing it for 11 years and I just know that the crowds, young and old and in between, just have a good time. If we didn't have their support, we just couldn't do it." Heuett likes to point out that the gang's namesake, Blackjack Ketchum, was a real Old West outlaw, though he never quite made it to the Wood River Valley and did most of his thieving in Colorado. "Blackjack Ketchum was an actual person and his claim to fame was that he was hanged," Heuett said. "When he got hung, they gave him too much rope and they actually decapitated him, They put him on display for two days after sewing his head back on Frankenstein-style."